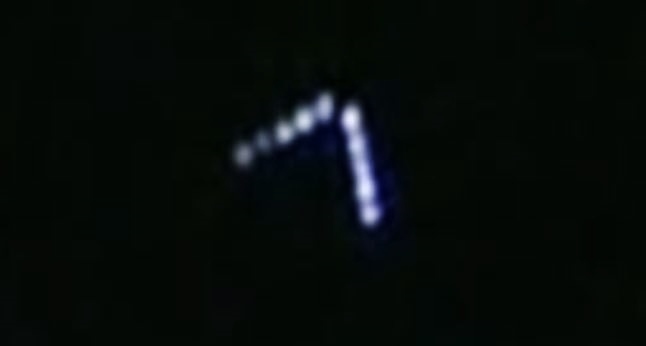 Large, silent V-shaped craft spotted traveling southeast quickly in a linear path. I was taking my dog out in my backyard and looking at the sky since it was unusually clear. While looking at some stars I noticed slightly dimmer lights (yellowish-white) in a V-shaped formation moving across the sky. I quickly reached for my iPhone in my pocket, looked down to pull up the camera, but by the time I was ready to take a picture, the object was passing over some trees. I did not have the time to count the amount of lights but I would approximate there were about a little over a dozen. They were about the size of the stars-that is, they were tiny lights, not large. These yellowish-white lights did not flicker or blink and were very close together, about six or seven forming each arm of the V-shape. Since the sky was very clear and dark, I could not make out an actual shape of the aircraft aside from the shape the lights made. The V-shape was neither too wide nor too narrow. It was shaped like a normal “V”. The aircraft was silent, but massive. If you stretch out your arm and separate your thumb and pointer fingers by about 2.5 to 3 inches, you will get a pretty good idea of how large it was. It moved very quickly across the sky in a linear path, meaning it wasn’t zig zagging around. I pulled up the compass on my phone to see exactly what direction it was heading in-it was heading around 150 degrees southeast, and coming from the north or northwest direction. NOTE: The above image was photographed in Yantai China on May,21 2011. I was suggested this web site by means of my cousin. I’m not positive whether this publish is written through him as no one else recognise such detailed about my trouble. You are wonderful! Thank you! Woah this blog is magnificent i really like reading your posts. Stay up the good work! You recognize, lots of people are searching around for this information, you can aid them greatly. Hello, i feel that i saw you visited my web site so i came to return the prefer?.I am trying to to find issues to enhance my site!I guess its good enough to use a few of your ideas!! Heya i am for the primary time here. I came across this board and I find It truly useful & it helped me out a lot. I hope to offer one thing back and aid others such as you helped me. Amazing things here. I am very happy to see your post. Thanks a lot and I am having a look ahead to touch you. Will you kindly drop me a mail? Admiring the persistence you put into this site and in depth material you offer. It really is great to find a site from time to time that is just not the same obsolete re-written information. Fantastic read! We’ve saved your site and I’m adding the RSS feeds to my best quotes ever webpage. I just want to mention I am beginner to weblog and seriously savored this web blog. Probably I’m going to bookmark your blog . You amazingly come with fantastic article content. Thanks a bunch for sharing your web page. Hello there, You must have done an admirable job. For certain I will surely digg it and actually suggest to our friends. More than likely they would be benefited from the site. I am really inspired along with your writing skills and also with the format for your blog. Is this a paid topic or did you customize it your self? Either way keep up the nice quality writing, it is uncommon to peer a nice blog like this one nowadays.. I used to be recommended this web site by my cousin. I’m no longer sure whether this put up is written by means of him as nobody else know such distinctive about my difficulty. You’re wonderful! Thanks! I became thankful to receive a telephone call from my pal quickly he noticed the fundamental suggestions shared on the site. Exploring your blog article is indeed a fantastic experience. Thanks for taking into account readers much like me, and I would like on your behalf the best of achievement for a professional in this field. I actually arrived over here from some other website about garageband mac and thought I might as well check out this page. I enjoy what I see therefore now I am following you. Looking towards looking into your blog all over again. You’re completely correct. I liked reading through this article and I will certainly come back for more as quickly as possible. Our website is on omega xl complaints, you can have a look if you are interested in that. Quite interesting. I think you made precious and legitimate points in this writing. Certainly with you totally and am delighted I had the chance to read this.